The epicentre of Patagonian climbing, El Chalten is home to a vast number of routes on many climbers' bucket lists. 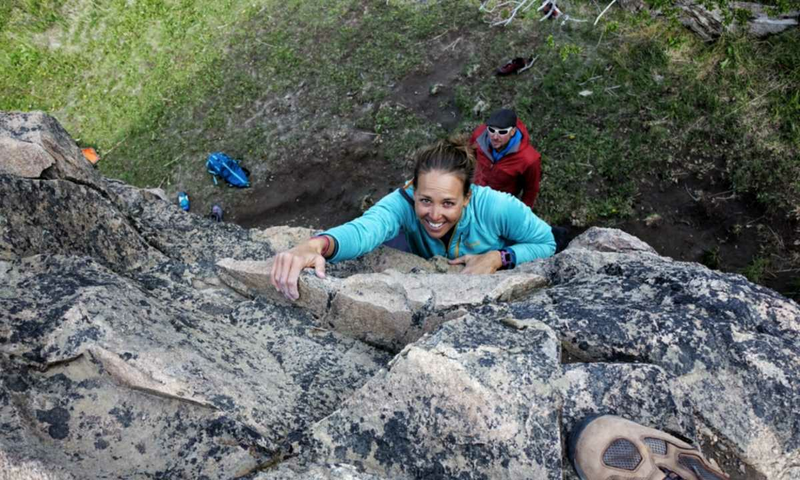 From big mountain multi-pitch routes to easier mountaineering goals, as well as a number of more relaxed sport routes on the edge of town, and even some bouldering! Whatever type of climbing you want to do, you will find it here. El Chalten is every climber's dream - it is the Patagonian hub of mountaineering and hard multi-pitch rock climbing. Every year groups of psyched climbers will travel to El Chalten to spend the season sat in town, looking at Fitz Roy and Cerro Torre in anticipation. They're waiting for that crucial weather window to go and ascend the projects they've been dreaming about all year. As well as hundreds of incredible routes in the mountains - from easier mountaineering goals to epic unrepeated multi-day rock climbing routes - there are also a number of sport climbing venues dotted around the town that make the perfect venue for training, or just a casual afternoon of climbing in the sun. Fitz Roy Massif: The iconic Fitz Roy skyline is a view that any climber will know well. Home to the seven summits of the Fitz traverse, Aguja De I's, Aguja Saint-Exupéry, Aguja Rafael Juárez, Aguja Poincenot, Cerro Fitz Roy, Aguja Mermoz and Aguja Guillaumet, this area has a swathe of classic routes and peaks just begging to be explored. The vast golden faces of perfect, solid granite are mostly ice-free, and offer some more 'moderate' free climbing. It also has a number of more amenable mountaineering goals such as Mojón Rojo, Cerro Eléctrico and Cerro Madsen. Cerro Torre Massif: Frequently shrouded in cloud, the Cerro Torre Massif is often hard to spot from town and can be a more challenging climbing goal. 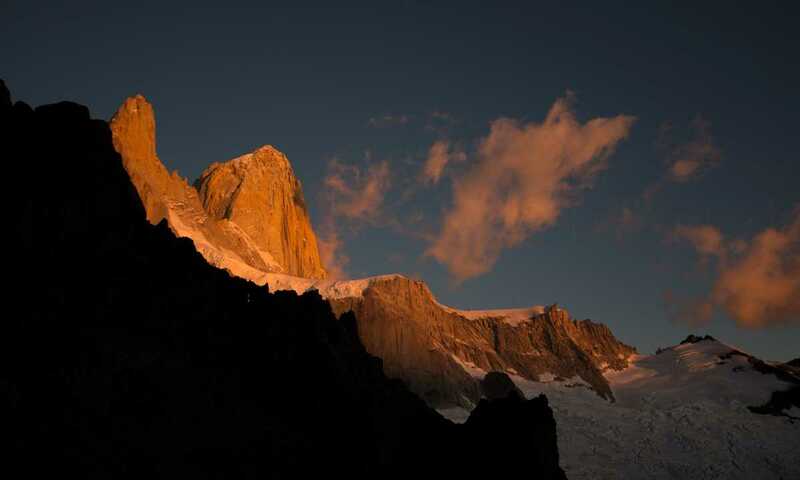 The four main peaks of the Cerro Torre Massif are Cerro Torre, Torre Egger, Punta Herron and Aguja Stanhardt. With much more ice on the peaks of these mountains forming 'rime mushrooms', a summit push can be much more difficult, and will involve more mixed climbing. El Chalten town is home to a number of hostels, boutique hotels and campgrounds, to suit every traveller's preferred level of comfort. There are numerous restaurants and bars, pizzerias and waffle houses, some with beautiful views of the mountains, most with a selection of locally brewed ales and IPAs for those relaxing rest days. There are a number of trailheads which head straight out of the town towards the mountains. So El Chalten is the perfect place to base yourself for a few days if you want to get some climbing done, and have somewhere to take your laundry afterwards! Fancy more of a mountaineering adventure? If you are a keen climber, El Chalten is sure to capture your heart - it certainly captured mine! There are regular flights from to El Calafate from Buenos Aires. There are regular buses from a number of nearby cities, both in Argentina and Chile, that will take you to El Calafate. From El Calafate there are regular buses to El Chalten which take around 3 hours. It will depend on how much rock climbing experience you have as to whether or not you need a guide. Typically only extremely competent climbers with years of experience will climb in El Chalten without a guide, as weather conditions can be fickle and most of the routes are quite committing. If you want to experience the magic of climbing in El Chalten but you don't have this much experience, you can hire a guide who will be able to help you pick a suitable goal for your time in El Chalten. If you've booked a trip or hired a guide, they will typically have most of the equipment you will need, although you should check about personal equipment (harness, shoes etc.). There are loads of restaurants and shops in El Chalten where you can buy food, but once you go into the mountains you will be by yourself, so make sure you pack enough food for your time away from the town!